Thread: 5" Charm Theme: I-Spy! Signup deadline is Monday, October 22, 2018. You may swap up to 15 bags, as long as each baggie has 10 different fabrics in them. Please Fussy Cut if your print requires it. Send the kind of nice squares you hope to receive. Please limit licensed prints and holiday prints to 1 per baggie. 1. Send what you would like to receive, quality-wise. Send only 100% cotton unwashed quilting fabric. Please do not send thin or loosely woven fabrics. If it has to be starched to be acceptable, it's probably not a good fabric for this swap. 2. Try and find new prints you have not sent/received/seen before in the swap, if at all possible. We all like new stuff! Please select prints that would be acceptable in a child's quilt. No flowers, lines, stars, geometrics, batiks. We need recognizable objects. If I find unusable fabrics in your baggies, I will return all to you unswapped. 3. Put your board name on the outside of the package! Yes, this is a duplicate request from above, but I can't tell you how much this helps me stay organized. Thank you!! 4. Put all your swap baggies in one big ziplock with your name and mailing address, as well as your board name. That will keep them together in your package and if it happens to get torn open in shipment, your address will be there for the P.O. to return to you. Try to order the plastic bubbled envelopes for free from the post office. The paper ones rip wayyy too easily. 5. Postage: I will be using the padded flat rate envelope. It now costs $7.25 for the padded flat rate envelope, so please use carefully hidden cash or money orders for return postage. Remember to send in what you would like to receive back. We are only swapping 10 fabrics? I am in for 15. I'm in for 15 also. This will be exciting to see what we all come up with . . . and especially since we are not confined to a specific theme. I'm in! Thanks for covering an I-spy swap, I have most of my fabrics already cut and waiting! I'll wait until I see what I have already cut, but I'm pretty sure I'll be in for 15 bags. I'll label mine as "sets" since I'll probably have 8 bags/7 bags of the same mix of fabrics. We've had some great fabrics come in for past swaps! If your dreams don't scare you, they aren't big enough! I'm in for 15 bags. Since I've not participated in the regular 5" charm swaps before, I want to be clear in the directions. As I understand it, all 15 bags can have the same 10 charms in them or they can be different, as long as charms are not repeated in the same bag. Correct? Last edited by bkay; 10-03-2018 at 12:20 PM. I am in for 15! In for 15. Would it be possible to request duplicates? I use them for zippered crayon pouches, and it's nice to have both sides match. If not, that's fine. I'm interested, but honestly don't understand what type of fabric works for I Spy. Do we go with larger prints that may require fussy cutting? or smaller prints where you'll have 3-4 objects showing no matter how you cut the fabric? Macy, you can do either. I have seen one bigger item in the center (fussy cut) and a few smaller items scattered in the square. I look at I-spy fabrics like this: If I were sitting down with a small child, and I wanted them to "find" something, would they be able to figure out what that something was by looking at the fabric I chose. I have gone so far as to take a 5" square along with me to the fabric store to place on the fabric so I could actually tell what they'd see once I have it sewn in the quilt. It helps, but I'm a visual learner that way. I've had a question about making the baggies bags of 15 instead of the ten rbwiese typically chose. I think bags of ten will be okay, particularly since we increased the number of bags to be limited up to 15 from our normal 10. Am I thinking of that correctly, or does everyone think we should change the baggie supply to 15 from 10? I can try to give duplicates. It will really depend on how many people we have participating in the swap. Many will not want dups, so the participating number will be the deciding factor. Remind me when we get that far. You of all people know my memory isn't what it should be! LOL!!! I would like to participate. This is my first time. I'll make up 15 with the 10 different fabrics. I would like to play - but my fabrics have all been washed with unscented laundry detergent. As far as doing the previews - you might consider using a 4.5 inch square cutout instead of a 5.0 inch cutout - because 4.5 inches will be the finished size (unless the squares will be cut smaller). 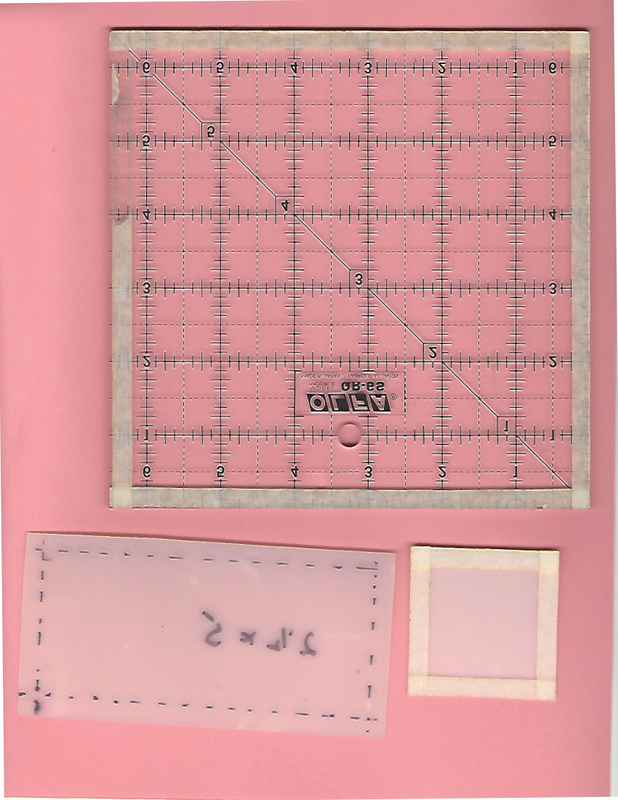 For fussy cutting, I cut a 5-inch square of template plastic - to mark the "seam allowance" - I did one of two things - I drew a 1/4 inch line to mark where the stitching line would go - or I taped 1/4 inch masking tape along the edges - so that I could "see" what would be showing. Bearisgray, I like your suggestion; it helps when choosing the perfect I-Spy fabrics. Thanks for sharing. Red, I am going to have to buy several fabrics for this swap so I do appreciate the "10-per-bag" this time. Besides I broke some bones in my wrist and cutting is more time-consuming this time around . . . just a minor inconvenience that is slowing me down. blhaines. Welcome! I hope you enjoy your first swap on the board. I don't know about you, but I've become a "tad" addicted to them. Getting things from other people, fabrics that I haven't seen before....Thrills and Chills! If you have ANY questions, please ask. There are no stupid ones. Ask me how I know. bearisgray is right! I love the idea of looking at the 4.5" view and seeing how the fabric works. I have several that will work, but plan on shopping in another week or two. Things are just a little nutty for me right now. We are up to 11 participants already! That's a fabulous start! Whoo hoo!!! Are they not supposed to be washed? I participate in the Yahoo I spy group where all fabric has to be washed. Every piece of I Spy fabric I have has been washed and ironed. I have no preference if washed or not. I have some that will be, and some that are not. They are all unscented and all ironed well. So.....whatever you happen to have on hand, bear! Your swap. Your rules. I just think it's a good idea to be either all washed or all unwashed. I guess I still don't have a preference. me either. I like the flexibility of either or. I wash all fabric coming into my house. The one time I participated in rbwieses' swap I had to buy fabric especially for her swap. If I have to do that again, I will not be participating . . . so I vote for "either/or". Have fun this month swappers. Even though I have hundreds of different quilt fabrics, I am lacking the ones to utilize in this months swap. Please send me a message if You haven’t had a response from me for the November swap. When I grow old I will wear Red and Purple, and imagine a world where fabric is free and Quilting makes you thin !